0762 Labor Saver Upright with Offset Arms - Jay R. Smith MFG Co.
Pre-assembled, Easy to Adjust, Good for Narrow Wall and Metal Stud Configurations. Contractors like the flexibility and ease of working with the Jay R. Smith’s Labor Saver® lavatory supports. These Fixture Supports come pre-assembled, work for most applications, and accommodate a variety of fixture manufacturers and configurations. The unitized structure makes installation much simpler and faster when compared with installing and getting two individual uprights plumb. Also, the adjustment brackets provide the opportunity to change rough-in dimensions, should the fixture be changed at the last minute. The Labor Saver® Fixture Support has been designed to speed up the installation process by using a one-piece, pre-assembled rigid steel frame construction. 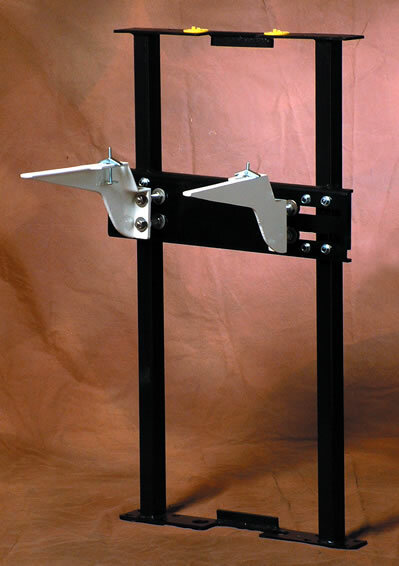 This innovative support allows for installation in narrow wall and metal stud configurations. Easier to adjust - needs front adjustment only after the wall is in place.